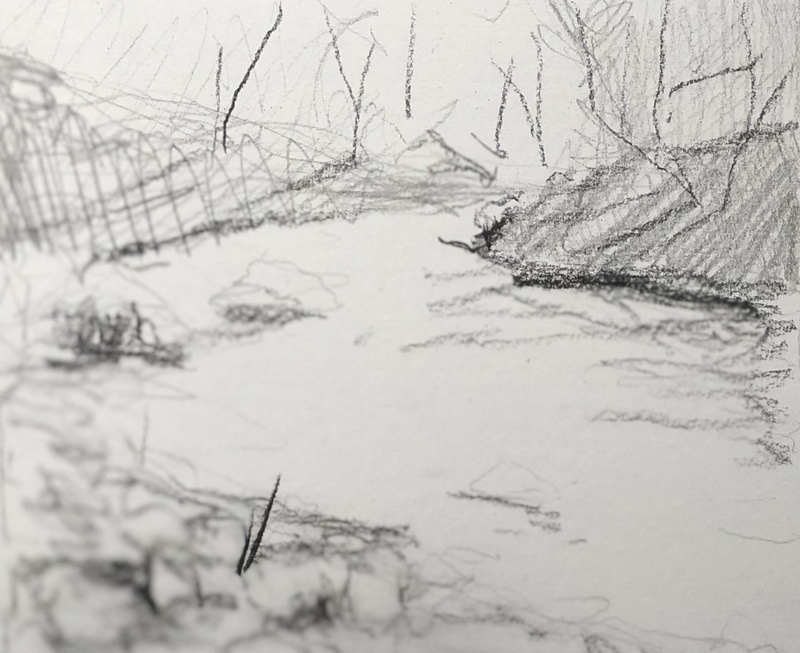 I wanted to try the Ravine again while the lessons from my last attempt were fresh in my mind. And – you just can’t leave the driving range on a worm burner. I didn’t bother with a value study because I wanted to paint this one from my last attempt. One of the things I was hoping to achieve was to get that very close to the ground perspective that’s seen in this photo of the value study. I think this feels so close to the ground because my camera decided to blur that bottom edge. I love the effect that has on this value study and I wanted to dry to emulate it in this photo. 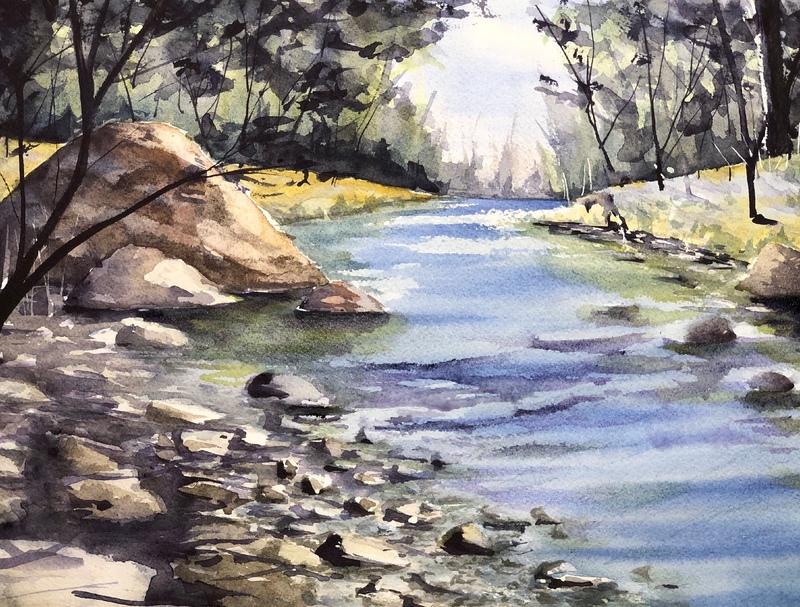 It didn’t quite work – but I think it’s because I went back in wet on dry to add shadows at the end. If I make sure to always paint wet in wet over there, I think it should give the effect I’m after. It’s something to mess with. Initial washes and some foreground detail. The last painting was so incredibly overworked – I wanted to make sure not to do that here. If you look at the background you can see the brilliant green that was the primary wash. This was cartoonish, and I needed to add some brown to dull it and push it back. 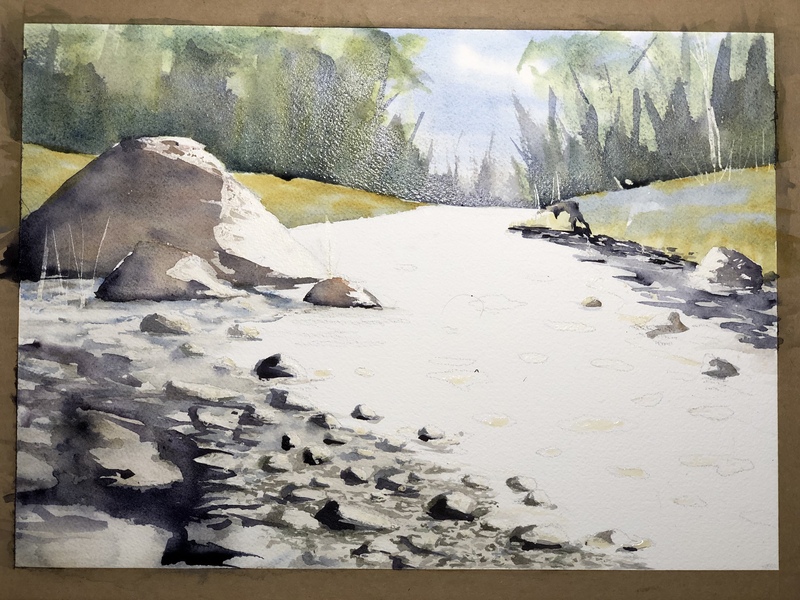 I was very worried this would create mud, but it seems putting down that layer and letting it dry helped make sure the first wash didn’t get lifted into the current wash.
For the near rocks, I started with a field of light Raw Umber and dropped in some Ultra Marine Blue, and Quin Purple. Once that dried I added shadows where the rocks were, trying to only paint the shadows on the lower left side. I used masking fluid to preserve highlighted faces because I didn’t think it would work to knife out so many rocks. 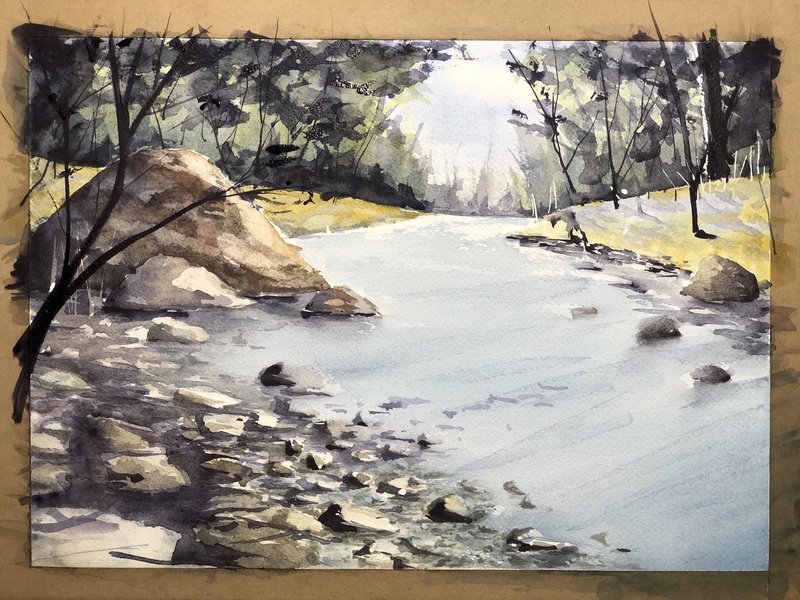 Next time, I think I’ll start with a field of color like I did here, then cover that with a wash of dark Raw Umber and Quin Purple, and knife out little highlights to create the rocks. If I do it right, I should be able to make a whole bunch of small rocks pretty quickly. Then I painted the trees in. I must say, I was nervous about that branch in the foreground, but the painting was so wide open, I felt like it really needed something close up. I was already pretty sure the whole out of focus foreground experiment wasn’t working, so I didn’t mind too much when adding the branch here seemed to reinforce a higher vantage point. Oh well. I also added some deep shadows to the trees hoping to start to describe that feel of being under a canopy of trees. I like the effect, but ultimately it doesn’t feel like we are standing under a canopy of trees here. I’m not sure what I could do here to make that happen, but I’m pretty sure anything I try now will just start to create mud. So, I’ll take what the painting is giving me, and let that go. I also added some ripples water using the technique I learned from Ron Hazell. Then, I painted in some reflections and called it done. I like parts of this. I think I managed to avoid missing things up for the most part, which is a huge victory in itself. I also like the effect of the deep shadows in the trees. I’m not crazy about the stones, especially the ones in the water. I think I was getting bored and started painting too hastily. Well, there it is. Another attempt to paint The Ravine.